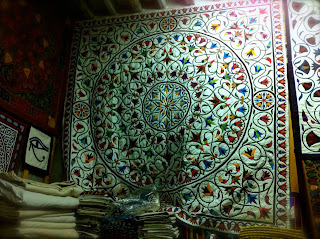 Jenny Bowker from Australia, has been working to publicise the work of the Cairo Tentmakers. They are a group of men who make amazing appliqué. I haven't seen any in person but from the pictures, I reckon they could win the hand applique prize at any NZ Symposium and apparently they cut out tiny pieces with enormous tailors shears. We used those huge shears during the Costume Construction course and I could barely open and close them, let alone cut out appliqué. 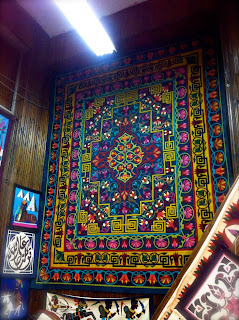 "The Tentmakers are a group of men in Cairo who make spectacular applique. 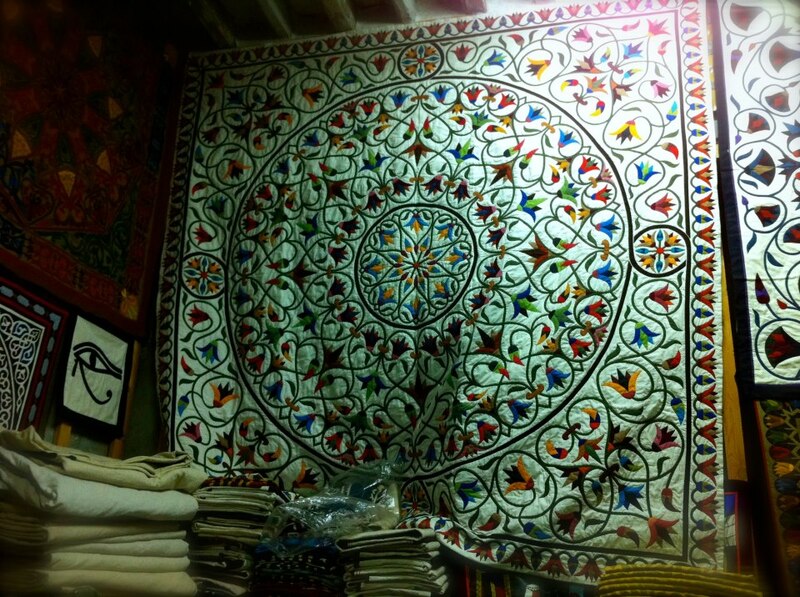 Nowadays most of what they make is intended for the walls of houses or on beds, but in Pharaonic, early Islamic, and Ottoman times it was intended for the inside walls of tents. With canvas behind it which formed the outside wall, the rich appliqué glowed with light on it, and was intended to amaze visitors to a leader's tent. Did you know that Cairo was originally called Fustat - which means the big tent? In pharaonic times the tents were appliqued leather, now all the work is cotton. And if you go to my Pinterest board on the Tentmakers you will see a lot of current work - and some that is much older and also some of the truly old tents so you can see how they were used. I think almost the best is Kim Beamish's Facebook page for the film as he is putting up constant new images, and there is a lot lot of historical input as well. The art has been slowly dying. Big pieces of cheap, badly registered, printed fabric made in China have poured into Cairo and people buy this rather that the real appliquéd pieces. On top of that disaster - tourism has stopped with unrest for the last two years. Without the work sold in to exhibitions that I have been arranging in other countries they would all be gone by now - instead - stitchers who left are coming back and young ones are learning again. I am thrilled with the progress we have made and very happy with the AQS who committed to them for three years. But - it is still hardly documented at all. There is not one piece in the Cairo Museum or even in the Cairo textile museum. The best article I have ever found is in the Uncoverings magazine and there are no books. Older stitchers are dying and no history has been written. Kim Beamish is an Australian friend who - when I took him to visit the street on his third day in Cairo - picked up the baton I offered and ran with it. He is making a film about the Tentmakers in these difficult times. He has given most of five days a week for the last seven months - or more. He has paid his own way to shows in England, and has had to pay for three more that have not even happened yet in France and two in America. He has become part of the street and the men are used to him and his camera. He has two young children and a wife who works in the Australian Embassy in Cairo. They have to pay a nanny so that he is free to film. He is, like I was, a trailing spouse. He did not choose to live the 'cocktail parties and bridge' life, but has chosen to go out on a limb to tell a very moving and necessary story. I know that at the moment he is on the bones of his behind financially and simply cannot afford anything else. The movie will not be made without funding for the essentials - the long and boring stages when the filming is done and the hard work starts. Editing, top level translation and the rest has to be done by experts and paid for. Please help. Even a little bit from a lot of people will add up to a lot - that is what crowd funding means. The link is now open and working. If he does not get to his total he gets nothing. Kim will spend the month hovering over the site and biting his fingernails. The work is really special and the film is essential. 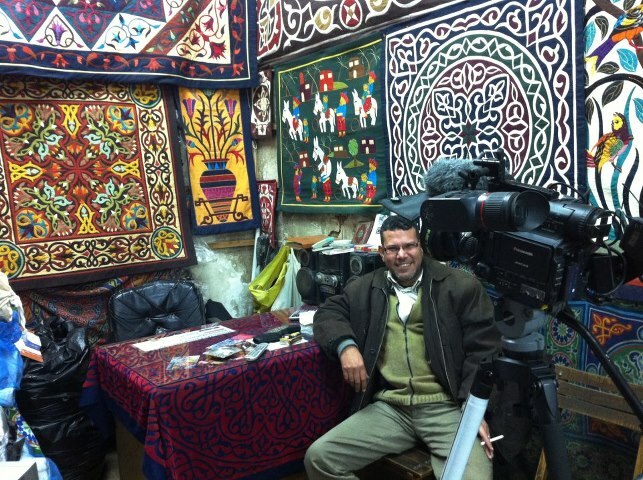 http://pozible.com/tentmakers - this is the link to support the Film - The Tentmakers of Chareh el Khiamiah. If Kim Beamish does not get this money the film cannot be made. Even tiny donations will help and big donations will help more. Please. If you use PayPal it will ask you to preauthorise. It sounds odd but it simply means that when the total is reached the money will then be taken from people's accounts so it has to be done this way. Kim gets nothing if he does not reach his total and that is the way that Pozible works. He is a bit worried at the moment as only about 29 have helped in three days. If anyone can help by donating some money for the documentary to be made - every little bit helps. The minimum pledge is U.S$10. I just donated something and it was easy once I'd worked through the forgotten password with Paypal. It is so long since I used Paypal. Thanks for putting this post up it is really exciting to see the level of interest in the Tentmakers. 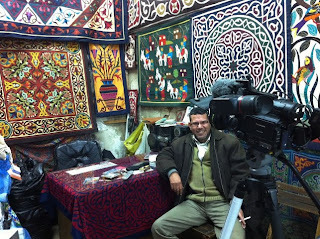 I have been filming now for six months with the guys in the tiny little Chareh El Khiamiah, the Tentmakers Street, and will follow them to shows in the US, France and the UK. However in order to do this I need the support of anyone who has an interest in the Tentmakers and in seeing a documentary film about them and their lives in Cairo. So if people are keen to support please go to http://pozible.com/tentmakers and help us to make a great film.